Those of you that heat and cook with wood, and make your own firewood will likely understand how the project takes over your life. It almost has to if it is going to get done. During the time of year I work on firewood, I use tools that are seldom used other times of the year. I need to keep the tools working properly, available, and handy. Sledge hammer handles seem to be an annual causality. I’ve repaired both the 8# splitting maul handle, and the 4# hand sledge handles so far this year, and on my trip to town earlier this week, I picked up replacements for both anticipating their future demise. 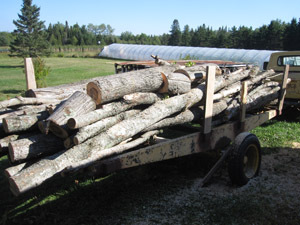 The picture is of the trailer load that was hauled from the woods yesterday. As of this writing, I’ve processed most of the back half of this load, and the woodpile is rising nicely again. The smell of freshly split wood is really nice too. As I said earlier, I try not to let anything interfere with the wood-making, but there is one exception. For about the last 15 years, I’ve been running the fly loft at the Calumet Theater for the fall musical that the Calumet Players put on. This theater has about 60′ from the floor of the stage to the grid. About half-way up is the fly loft, which is reached by a strange old iron ladder. Not everyone is comfortable with heights, and as such, are a little in awe of what goes on up there. This loft is what is known as a “hemp house,” meaning the flys are counter-weighted with sandbags. My job is to help hang the drops, counter-weight them, make sure everything is safe, and raise and lower the drops on cue from the stage manager. 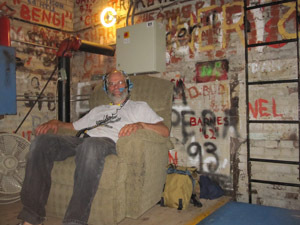 Once the drops are all hung and weighted, and I understand my cues, I can spend my downtime in the fly-loft chair. This chair belonged to our neighbors until recently. They donated it to the theater when they decided they no longer had room for it. This show is the first one I’ve been able to use it, and it is a very nice place to sit. The only downside I can see is when I’m comfortably settled in, I sometimes resent the cues from the stage manager. Normally I’m well done with my firewood by the time the fall play comes around, but this year numerous delays have made them coincide. I’m doing my best to blend the two projects, and I think I’m succeeding. This entry was posted on Friday, September 9th, 2011 at 4:34 pm and is filed under Uncategorized. You can follow any responses to this entry through the RSS 2.0 feed. You can leave a response, or trackback from your own site.